” The National Rural Health Alliance has been leading advocacy to the Government that it is time to develop a new Rural and Remote Health Strategy, together with a fully funded Implementation Plan. This paper has been prepared to stimulate discussion on an issue of importance to rural and remote health. The views and opinions in the paper do not necessarily represent those of the National Rural Health Alliance or any of its Member Bodies. A new strategy and plan ? There is no point in continuing to reference a Framework that is not in use and that is deeply flawed (see background 1 below and in download ) . Whatever document replaces the Framework, it must include outcome measures and set indicators to measure progress against the most pressing needs. And there must be annual reporting against those outcomes to enable jurisdictions to consider how they are progressing and fine tune their responses as necessary. Ideally, a new National Rural and Remote Health Strategy should be developed with stakeholder input and introduced with a fully funded Implementation and Evaluation plan. This should include, but not be restricted to, a rural and remote workforce plan – as pointed out throughout this report, the solutions needed to bridge the divide in the health and wellbeing of the city and the bush deserves and requires far more. We need concrete, on-the-ground actions, which make a positive difference in the lives of individuals, families and communities in rural and remote Australia. The Alliance has been an active participant and co-signatory in the development of previous strategies and plans, and stands ready to fulfil that role again. 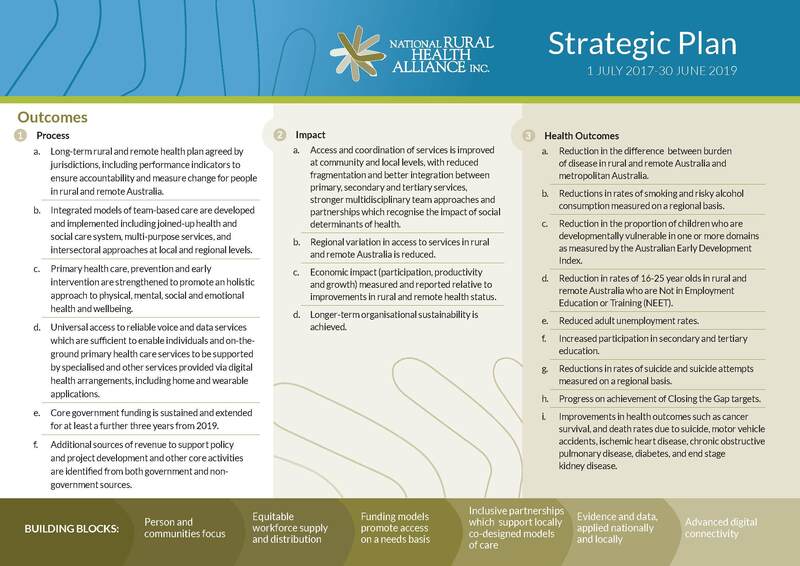 The National Strategic Framework for Rural and Remote Health (the Framework) was developed through the Rural Health Standing Committee, a committee of the Australian Health Ministers’ Advisory Council, and agreed by the Standing Council on Health, the committee of Ministers of Health, in late 2011. It was launched in 2012. 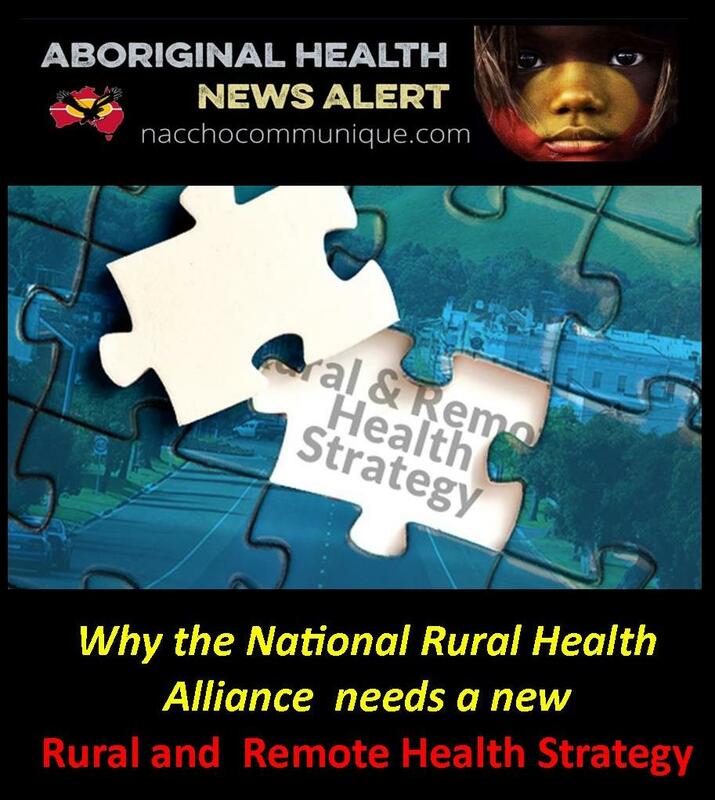 The Framework was developed through a consultative process that included significant input from the National Rural Health Alliance (the Alliance) and other rural and remote health stakeholders, including State and Territory governments. Further, the health workforce strategy developed as a companion document to the Framework – National Health Workforce Innovation and Reform Strategic Framework for Action 2011–2015 – is also no longer in use, having been archived when the Health Workforce Agency was disbanded in 2014. At the time, the Alliance called for a National Rural and Remote Health Plan to be developed to operationalise the Framework, but this never eventuated. The role of a comprehensive Framework to guide and direct better health outcomes in rural and remote communities is critical. Where players from communities, jurisdictional and private health providers and federally-funded organisations come together to meet the challenges of delivering health services in rural and remote communities, it must be through a shared understanding of the issues and a clear vision for the future. At the outset, the Framework acknowledged that the people who live in rural and remote Australia “tend to have lower life expectancy, higher rates of disease and injury, and poorer access to and use of health services than people living in Major cities”.  higher incidence of babies born with low birth weight to mothers (in very remote areas). The Framework does not include data quantifying these concerns. In referring back to Australia’s Health 2010, the data used to describe the health of people in rural and remote Australia is from 2004-2006 – it was already up to six years old at the time the Framework based on it was launched. It is very difficult to plan appropriately to address inequality when data is this out of date. In developing this Discussion paper, the Alliance is seeking to undertake a high level, selective assessment using publicly available data to ascertain to what extent progress is being made in addressing health concerns and inequities in rural and remote Australia, referencing back to the goals and outcomes set out in the Framework. Where related specific programs stemming from the Framework can be identified and their outcomes assessed, this will be included in the discussion. Given there are nine specific issues identified in the Framework and set out in dot point format above, the Alliance will seek information on only three to discuss whether any change in outcomes following the implementation of the Framework can be assessed accurately, and if so, what outcomes were achieved. 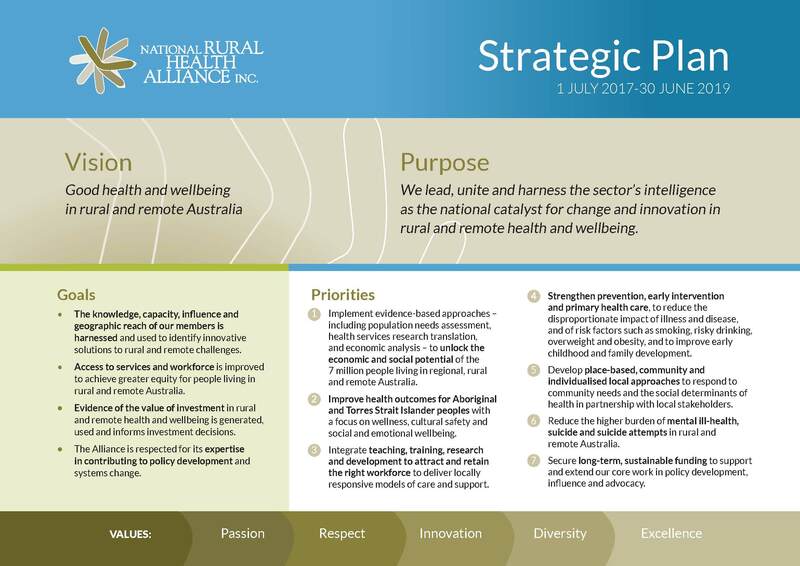 The National Rural Health Alliance’s new Strategic Plan has been released and spans the period 1 July 2017 – 30 June 2019. It is a high-level document to set directions, priorities and key areas of activities over the coming two years. It also includes measures of success and effectiveness, identified as process, impact and health outcomes. Securing long-term, sustainable funding to extend our core work. These seven priority areas have been strongly influenced by the recommendations coming out of the recent 14th National Rural Health Conference held in Cairns. Further, these are all areas in which the Alliance believes further efforts and advocacy is required to improve the health and wellbeing of people living in rural and remote Australia. A common link across all these priority areas is the need for a National Rural and Remote Strategy and associated Implementation Plan. The Alliance will work with members and other stakeholders in the pursuit of such a Strategy and Plan. The Alliance is currently developing a workplan that will guide specific work streams.